The classic paper-back style of book that everyone knows and loves. RECOMMENDED. adds a thin protective layer of plastic film to the outer covers of the booklet. Adds an extra-thick layer of high gloss spot UV to highlight selected areas. Perfect binding is the style of binding used to create the flat, square spine you'd expect to see on most paperback books. It is best suited to books containing over 40 pages.Here you can calculate prices for Perfect Bound Books of between 42 and 350 pages in 4 popular sizes. Whether or not you request a proof, all supplied artwork files undertake our rigorous 10 point file check to ensure your printed job turns out exactly as you intend. Files are automatically impositioned ready for printing in the most effective way to minimise waste. Every job is sent to print with a FOGRA colour-matched proof to ensure high levels of colour accuracy. Choose from coated and uncoated materials for both the covers and inner pages of your books, or mix and match as you see fit. Every job at Flexpress is printed using the finest technology available. You wont receive any products printed on beefed-up photocopiers from us - another reason we back everything with our total satisfaction guarantee. Perfect-bound books are printed using HP Indigo Offset offering arguably the finest quality print available. The perfect binding process that Flexpress offer uses fast and effective EVA (Ethyl Vinyl Acetate) hot-melt adhesive, the original and traditional form of glue which has been used to perfect bind books successfully for many decades. The process involves 'roughing' the spine of the book block enabling the hot melt glue to embed into the fibres of the paper which then ensures strong adhesion of the drawn on cover. EVA hot melt adhesive dries to full strength within minutes so finished books can be handled with confidence quickly. To see how strong the finished bind is see our demonstration video. Lamination adheres a protective plastic film over the book cover and is always recommended for perfect bound books to enhance the look and feel of the book, protect the print and increase the lifespan. 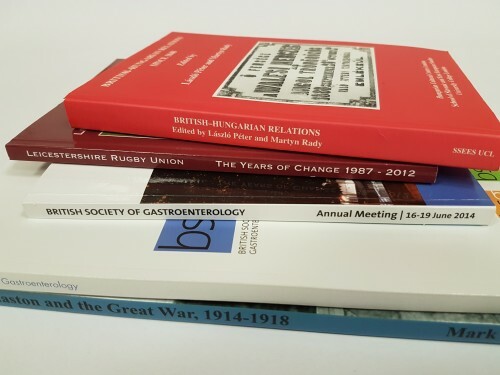 If you want to make your book cover quite literally stand out, choose our raised spot UV gloss embellishment which is available as an optional extra. What about the cover and spine? Please design the front and back cover at the same size as the inner pages, using the templates above. For the spine however, please use our Spine Width Calculator to determine the correct size. The cover then needs to be supplied to us as spread, inclusive of the front, spine and back. If downloading the PDF template - we recommend you lock these on a layer behind your design so you can ensure all artwork is accurate and in the correct position. For artwork best practice, take a look at our Artwork and File Information page.